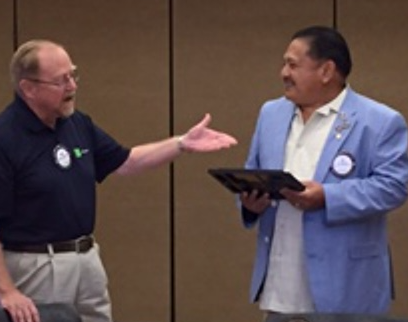 Outgoing Club President Don Bierman has passed the baton to incoming President Al Atienza for the 2017-2018 Rotary year which begins on July 1. This annual tradition signifies a continuity of Club governance to serve our community and around the world, and have fun doing it. Although Al has only been with our Club for three years, he brings impressive credentials. Al has honed knowledge and leadership skills by completing the District’s President Elect Training Seminar earlier this year and, more impressively, recently graduated from the District 5170 Advanced Leadership Training program. This elite, year-long program strives to develop true leaders in Rotary through extensive study and implementation of service projects. Al said that he initially joined Rotary to network with others to promote his coffee franchise business. But as he experienced the good Rotary does, he now counts himself as a true Rotarian. We all look forward to work under Al for another great year for our Club. Don Bierman did not leave office unnoticed. We celebrated the end of his year will a great dinner together and some good hearted chiding of Don’s leadership. Enjoy a photo gallery of the event.